Project Thor, a San Francisco-based Blockchain project, is closing down as the project was unable to get traction and find commercial success. The announcement was made by the CEO and co-founder of the startup, David Chin, on April 9. Built on the NEO Blockchain network, Thor announced its closure and said that it was due to the fact that it was unsuccessful at raising funds to offset its lack of sales. The company also stated that it had been unable to find a place where it could have benefitted from further resources. Chin also stated that the company had been unsuccessful to find a buyer so that the project could continue. The well-know venture capital fund Polychain’s assets under management were at $591.5 million at the end of the March 2019. This information was taken from a recent filing with the US SEC (Securities and Exchange Commission). However, this number is significantly lower than the company’s filing in August of 2018, which showed that the venture capital fund’s assets under management were at $967.8 million. Thus, this latest filing showed a $376.4 million drop in the company’s operations. Polychain is now no longer a billion-dollar operation. The company that created the smart contract programming language called DAML (Digital Asset Modelling Language), Digital Asset, has entered into a partnership with the cloud computing major VMware. The announcement was made on April 11 via a press release. According to the press release, Digital Asset will integrate DAML onto VMware’s platform. This will reportedly allow for a larger reach as well as support in a combined offering. According to VMware’s senior director of Blockchain Michael DiPetrillo, Digital Asset’s DAML has proven to be one of the few languages that has the ability to model very complex workflows at scale. 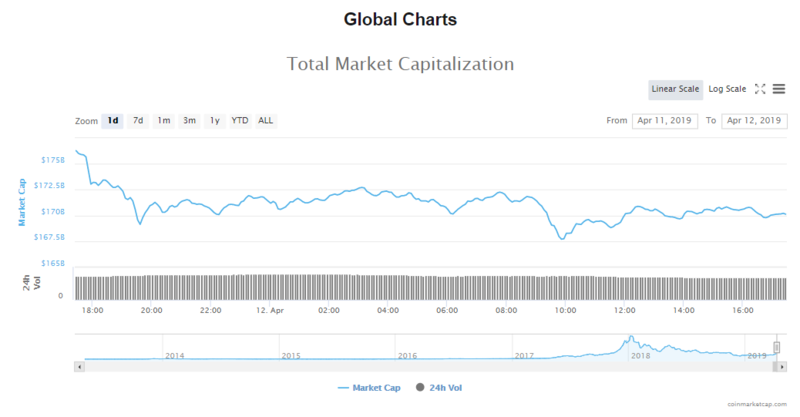 The market’s capitalization in the last 24 hours has dropped to $170.05 billion. Trading volumes are $53.91 billion. Since yesterday, the price of Bitcoin has continued to drop, and it is now down by 2.51% to $5028.12. Capitalization is at $88.70 billion and the volumes of trade in BTC are at $15.25 billion. 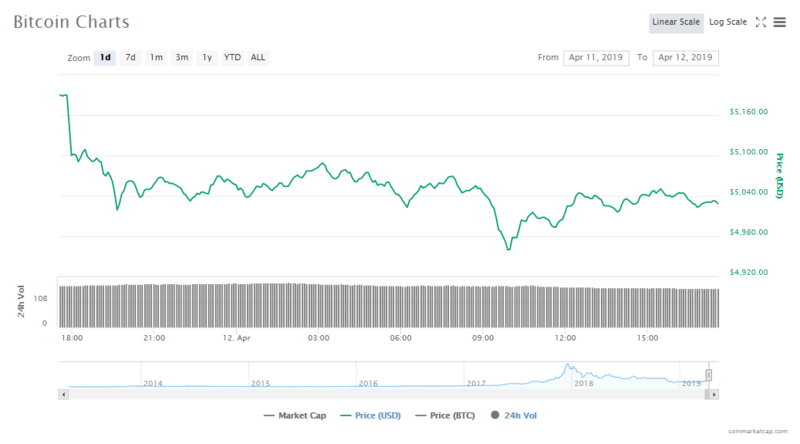 ETH’s price continues to nosedive, falling 3.19% in the last one day to trade at its current $162.89. Capitalization is at $17.20 billion and the crypto’s volumes in trading are at $6.97 billion. 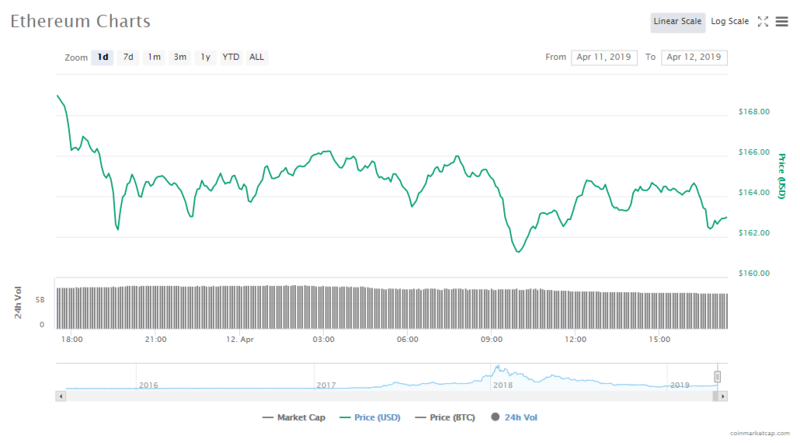 In the last 24 hours, the top listed cryptocurrencies have continued to decline. The biggest falls have been experienced by EOS, whose price has fallen by 4.98%, Stellar, which has lost 4.02% and Bitcoin Cash, which is currently down by 3.97%. Tether continues to gain, up by 0.10% and is now up one more spot to 7th place. Bitcoin’s trading at $5028.12, falling 2.51%. At this time, the asset’s market cap is $88.70 billion. Ethereum’s trading at $162.89, falling 3.19%. At this time, the asset’s market cap is $17.20 billion. Ripple’s trading at $0.323670, falling 3.93%. At this time, the asset’s market cap is $13.52 billion. EOS’s trading at $5.29, falling 4.98%. At this time, the asset’s market cap is $4.79 billion. Litecoin’s trading at $77.77, falling 3.56%. At this time, the asset’s market cap is $4.726 billion. Bitcoin Cash’s trading at $266.49, falling 3.97%. At this time, the asset’s market cap is $4.723 billion. Binance Coin’s trading at $17.41, falling 0.58%. At this time, the asset’s market cap is $2.45 billion. Tether’s trading at $1.01, rising 0.10%. At this time, the asset’s market cap is $2.32 billion. Stellar’s trading at $0.113368, falling 4.02%. At this time, the asset’s market cap is $2.18 billion. Cardano’s trading at $0.081728, falling 3.07%. At this time, the asset’s market cap is $2.11 billion. The Roskomnadzor, the Russian Government’s media supervision agency, has finally banned the popular messaging application Telegram. In 2016, the Russian government passed anti-terror laws and as a part of that law, all messaging services were required to submit their encryption keys to Russia’s Federal Security Service. Bitcoin just ended the worst month of price declines in the last seven years from a month-on-month price declines standpoint. Since the beginning of November, the price of Bitcoin has fallen by almost $2400, which means the cryptocurrency’s price dropped by 37.4% in the last one month. The cryptocurrency exchange Coinbase, which is based out of San Francisco, is now opening an office in Dublin, Ireland. This new office, which will help the exchange expand its services in Europe is also a part of the contingency plan for when Brexit finally happens. The Conseil d’Etat, or Council of State in France has reduced taxes on cryptocurrency sales from 45% to a flat 19%. The Council stated that this was done because of the new classification of cryptocurrencies. Now, the sale of Bitcoin falls under the principle from the classification of capital gains of movable property.